Remember Stephen Colbert’s thrilling 434-part series? This is just like that, only with Seattle area bicycle counters. Once upon a time I wrote about the Fremont Bridge bike counter at the Seattle Bike Blog. Now SDOT publishes data from nine bike counters, and the plan is to run through them one at a time, breaking down the trends and complaining about the poor quality of Seattle Open Data. Catch the previous installment here. So. South Seattle. Sure, everybody knows that there’s a daily pelaton, no, a downright army of white guys in spandex bicycling across the Fremont Bridge and racing each other up Dexter Avenue. You’ve seen them, every day of the year, with their flashy lights, clippy shoes, and boutique waterproof messenger bags, pedaling from north end neighborhoods to downtown jobs. But what about parts of the city that are perhaps not as traditionally white and prosperous? Does Seattle’s bicycle culture extend there as well? Remember Stephen Colbert’s thrilling 434-part series? This is just like that, only with Seattle area bicycle counters. Once upon a time I wrote about the Fremont Bridge bike counter at the Seattle Bike Blog. Now SDOT publishes data from nine bike counters, and the plan is to run through them one at a time, breaking down the trends and complaining about the poor quality of Seattle Open Data. I thought that I would start with the Burke-Gilman Trail near Magnuson Park in honor of the recent opening of the Montlake bike/walk bridge. The completion of Burke-Gilman construction through the UW will certainly be a relief for a lot of people. As the Seattle Bike Blog says, “With the addition of the bridge, biking and walking in the area will be essentially unrecognizable from just a few years ago.” After checking it out this week, I completely agree! 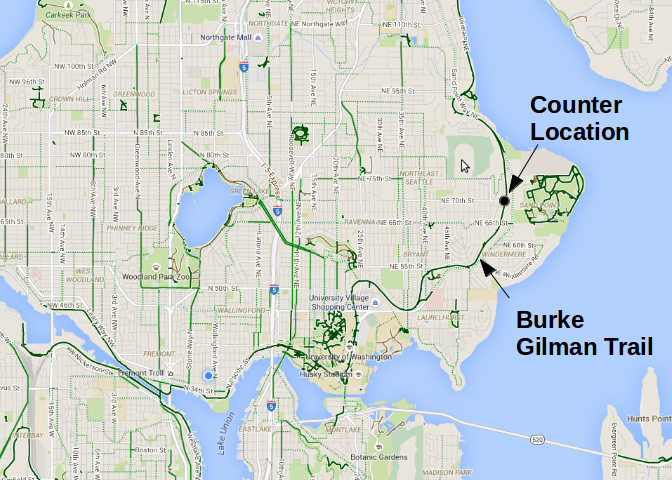 Now let’s head a few miles northeast and check out the measured bicycle traffic along the Burke-Gilman trail near Magnuson Park. Below is a Google Maps image of northeast Seattle with bicycle routes highlighted in green. Allegedly the counter is somewhere around NE 70th Street near Sand Point, which is a few miles from the UW and the Montlake Triangle mentioned above. I don’t know enough about how the counters work, but at the very least there’s no obvious visible sign such as the totems at the Fremont and Spokane St bridges, which is why I’m not sure about the exact location. The general location is marked on the map. This bicycle counter started reporting data on January 1, 2014. It wouldn’t be a Seattle Open Data project, though, without data quality problems. The bicycle trip records are missing for June 2015 and dubious for May 2015. For example, on May 17, 2015, the counter recorded 2078 northbound bike trips and 4 southbound bike trips. This seems highly unlikely. Throughout basically the rest of the data the northbound and southbound trips roughly balance by day, so it would suggest that the extreme imbalances in May 2015 represent data errors. Because the total counts look plausible, though, I’ve left in the daily totals from May 2015 for this analysis, and chalked that up to an apportionment error.